Design your dining room or recreation room in style, with a 49 inch Round table that can be used as both a dining table or game table. With its convenient shape for hosting gatherings, this piece is sure to evoke a sense of community. 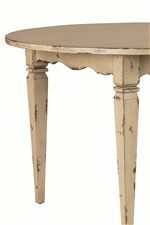 Supporting the table are four tapered legs with a serpentine apron for just the right amount of ornate detail. Completing the look is a timeworn, vintage finish with characteristics of flecking and chipping. Encourage your guests to linger when paired with the upholstered oval-back, armless Foster Dining Chair. The Modern Bungalow 49 Inch Round Table by Linwood Furniture at AHFA in the area. Product availability may vary. Contact us for the most current availability on this product. Case Detail Select Items Have Spindle Legs, Slender Legs, Spool Legs and Turned Ball-and-Ring Legs.